This is the final part of a five part series on Seneca’s On the Shortness of Life. Read Part I – Finiteness, Part II – Protecting time and living in the present, Part III – Desire and life goals, Part IV – Learning. A typical person living in the Western world is expected to live until about 70-80 years old. There are other factors that come into play, such as income, lifestyle, and access to healthcare, but all that aside, the average life span of a healthy adult is about 70 or so years – if you’re lucky. Do you know how many days that is? Answer: it’s about 25,000. That’s about 25,000 sunrises, and 25,000 sunsets for you to enjoy during your one and only time on Earth. Sounds like a lot, right? But there’s a small catch. If you’re like me, in your mid-20’s, you’ve actually already used up about 9,000 of them. Okay… so that leaves about 16,000 – still, not bad right? But that’s supposing you really are going to live until your mid-70’s… which, of course, isn’t a guarantee. What if you only lived until you were 60, or 50, or even 40? (If you’re roughly my age and you only live until 40, that’s less than 6,000 days left). Sh*t.
Now consider how quickly, say, the last 7 days went by. Hm, pretty quick right? It seems like it was just a day or two ago that I was in spin class, but I only go once a week, so that was a whole week ago… Now that I think about it, the last month went by quickly as well… I can’t believe we’re halfway through the year already… and it seemed like it was just a few weeks ago I was living in Japan, but that was an entire year ago now… wow, where did those 365 days even go? 365 is a sizeable chunk out of 6,000! Sh*t. Sh*t.
They’re going by stupidly fast. If this is a depressing subject to you, then you might be thinking about it in the wrong way. It’s only when you realise that your time is finite that you can start to do something about it. Knowing this, what are you going to do in the next 7, 30, or 100 days? Would you live your life differently? How do we know we’re going to live until we grow old? We don’t! Nobody does. So I can’t help but think – why do so many people waste their precious time being unhappy? Why do people put up with jobs they hate for 40 years, just to save up holiday time for when (or if) they reach 65? I’m no exception to this kind of thinking. We can’t always do the things we want to, and we’ve got to make a living somehow, but if we’ve really only got a few thousand days to live, why spend them doing things that our heart isn’t into? The saddest thing is that most people don’t realise how much of their lives they had wasted until they reach the end of it. Usually, these are the same people who don’t like thinking about death at all, because they’re living in a deluded world where if they don’t think about it, it won’t happen to them. But by then, it’s too late to do anything about it. At the end of your life, if everything you did could be summarised into an epitaph, what would it say? What would you want it to say? You might not get an actual epitaph, but no matter what, you will have a legacy. Your legacy could be celebrated by millions, or remembered by no one. At the end of your life, it wouldn’t matter to you which one of those it is. You won’t be bringing it with you anyway, wherever you’re going. Which is true. But it doesn’t have to take your whole life – you could wait until you’re on your deathbed to lament on the time you could have spent on the people and things that mattered. Or you can start now, while you can. Choose to spend today wisely, as if it was a single precious gold coin that you could never get back. While we’re at it, we can do the same for tomorrow as well. And the day after, and the day after, until we reach the end, whenever that may be. You could be happy from right now. Start today. 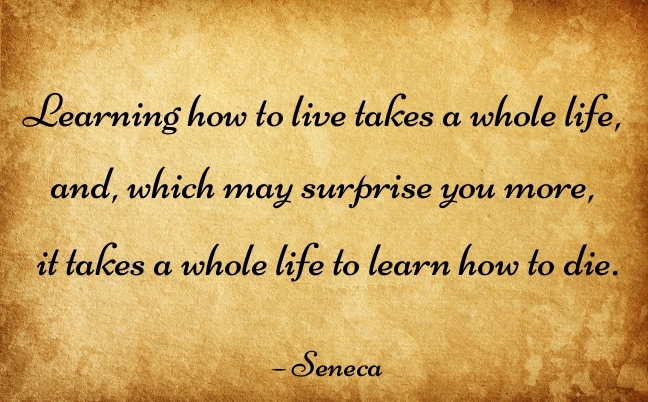 Who needs a lifetime to learn how to live? This entry was posted in Happiness, Life Lessons on June 21 2015 by Jessica.